I seem to have slacked on the blogging aspect of Juneathon, but the last few days were not without excitement. On the Monday, though I had decided to aim for 100 miles running for the month, I failed to run at all, and also realised that one run had been recorded twice. This left me with more than thirty miles to make up in four days. I did swim in the sea, however. My Juneathon mistake has been to be to attempt too wide a range of activities. On Tuesday I ran a seafront run, early in the morning, putting nearly six miles in the bank. On Wednesday I ran twice, a beautiful morning run, the light clear and fine, the sea flat and pellucid, and in the evening I ran with the Striders, to High and Over and down to the Cuckmere. I rarely run twice in one day, but, apart from odd twinges, everything worked. Finally, today, with a target of 11.5 miles, I set off for Firle Beacon, out via Bishopstone, home via Bo Peep and Fiveways. On the tops of the hills it was chilly. I was by no means fast, I met the same couple with a psychotic dog twice and my legs hurt. Nevertheless, I arrived home in one piece. The rest of the day contrived to celebrate my century. I allowed myself a glass of wine with lunch, taken in the garden, of spaghetti with an Abruzzi sauce of lamb, tomato and chilli. In the afternoon, The Mikado was on Radio 3. And in the evening I made a curry, and listened to Trevor Pinnock at the Wigmore Hall. I enjoyed Juneathon. I should have made a greater effort to mix online with my fellow sufferers. I shall probably not be able to go to the celebratory 5k and picnic in London. LIke everyone, though, I abase myself before JogBlog, the high priestess who presides over these rites and without whom none of this would happen. I am sorry for teasing her about the sestina. Today I ran the Stanmer Parks Races 8k. I await my official time, but by my watch it was 44:37. This represents a personal best as I have never run an 8K before. It was a pleasure to run over ground I knew well, that I used to run on often with the BSMS runners, Two of them, Claire and Mel, were there today, and so was a fellow Juneathoner, Psycho Jog. i found the first section the hardest, not because of the hill, but because of the tussocky surface; after that it was straightforward running through the woods. It was enlivened by a rave in the depths of the woods, whose patrons cheered us on enthusiastically. I also had an enjoyable sea swim, about ten minutes in much warmer water. There was no swimming lesson today, due to mould in the pool. I would quite happily swim in a mouldy pool. I'm sure I have swum in worse in my time, at at my age, a little Edelfäule, pourriture noble, is perhaps no bad thing. So I ran. I would not usually run the day before a race, but this is Juneathon. I went over to the Cuckmere estuary, and back over Seaford Head, on one of those odd days of simultaneous fog and wind. 6.5 miles is a useful contribution to the target of 100 miles before then end of the month. * Running miles only. This doesn't include swimming, gym and other Juneathon activity. So, with my new resolve to make my century before the end of Juneathon, I ran five miles today. I went along the sea-front, a route I've neglected lately. 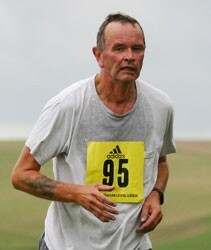 Thanks to Bradypus, I discovered there will be other Juneathoners at Stanmer on Sunday, to wit, one Psycho Jog. I swam 750m today. Good stuff, especially as my swimming lesson on Saturday has been cancelled due to mould in the pool. I do hope it's not something I left there; at my age, you do wonder. There was a flutter of #Juneathon tweets today by people who'd broken the 100 mile or 200 mile barrier. Indeed the leader is over 300 mile. I thought I'd check where I was: not far short of 100 I fondly assumed. The dreadful truth is that I have only managed 58 miles of running. I can claim some swimming and gym training too, but the running is unimpressive. So, with seven days left, this is the plan. I have two runs I can count on, Sunday's 8K race, part of the Stanmer Park Races, and next Wednesday's with the Striders, which will be 7.5. So here's my plan: run five miles everyday for the next seven days, apart from the dates above, and make no exception on swimming and gym days. There was a fine turn-out for tonight's club run, in spite of windy conditions. My group headed out to Friston Forest, where there is some shelter from the wind. The solstice occurred at 18:16 this evening. At that time I was at a poetry reading, introducing Jeremy Page, reading from his collection, the Cost of All Desire: After Catullus. I think introducing poets should count as a Juneathon activity in its own right. However, I did also run to the gym, and then rowed, climbed, cross-trained and so on. I swam today, 750m, alternating front crawl with breast-stroke. I wondered about the changing rooms. I am clearly not yet recognised as a regular. In a small seaside town like this, I expect it will be several decades before I am accepted. I recall the changing rooms of the swimming pools I would visit with my father. His routine included a daily swim before lunch, and his fellow swimmers knew him well. Many were his patients, and, as well as deep debates about swimming technique, there would be impromptu consultations. I have no diagnostic or therapeutic skills, but my librarianship expertise is at the disposal of my fellow swimmers. Those changing rooms were civilised, unlike those at school, a Gehenna of mud and sweat. The bigger boys took all the seats, leaving the smaller ones to try to change standing up, or to wait, in cold wet rugby kit, until they had finished. Masters would appear from time to time, linger by the showers, but show no interest in enforcing order or protecting the weak. I can't remember if, in Rural Rides, Cobbett ever made it to Seaford. I thought of this as I ran past fields of crops, broad beans, wheat, flax. Cobbett could go from a single onion to a fervent denunciation of the destruction of rural life by capitalism. I lack his intellectual breadth and agility. I see a field of beans and think, 'oh, a field of beans'. However, I did wonder about walking, running, riding as a stimulus to writing. I've just been reading the most marvellous book, which everyone who lives in or knows Sussex should read, Olivia Laing's To the River, in which she walks the length of the Ouse. I ran six miles, with stiff and painful legs. Today was a swimming lesson day and the lifeguard, who had not been on duty for several weeks, was kind enough to remark on how much I had improved. I found this gratifying, for so much of my athletic experience in recent years is of decline and degeneration.